Today finally felt like the first day of fall. Temperatures fell in the low fifties (can you believe yesterday was in the 80s?! ), the winds were blowing from the north, and clouds were hanging low just for the fun of it. It just felt like the perfect soup weather. So, I looked through my fridge and pantry to see what I could use to make soup. The result–a new recipe and one we will definitely make a gain–my own version of Spaghetti Soup. Yum! Everyone in the family even asked for seconds, pure signs of a good meal. Brown and crumble the turkey sausage in a medium stock pot. Add remaining ingredients except for pasta. Bring to a boil stirring occasionally. Lower to a simmer, cover, and cook 10-15 minutes or until carrots are cooked to desired tenderness. Add pasta and cook for 10 more minutes, stirring occasionally until pasta is cooked. Garnish with parmesan cheese, if desired, and serve. 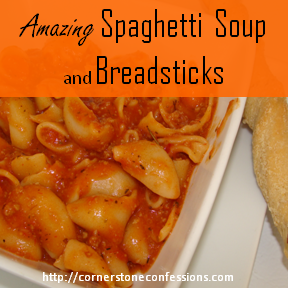 For the breadsticks, I used this recipe from Little Indiana which we loved! For the butter topping I mixed 6 tablespoons melted butter, 1/2 teaspoon salt, 1/2 teaspoon garlic power, and 1 teaspoon Parmesan cheese, brushed them on the completed breadsticks. Although not necessary, I then put them back in the oven for a couple of minutes to let them brown a little before serving. They tasted fabulous! I almost thought we were at the Olive Garden or something. Enjoy! Yum! This sounds delish! Will def. have to try it this week. They’re calling for snow Tuesday. That’s crazy! Have fun playing in the snow.